LONDON - U.K. Prime Minister David Cameron says Iran's failure to defend the British embassy from an attack in Tehran was a disgrace that will have serious consequences. Cameron called the storming of the embassy in Tehran on Tuesday "outrageous and indefensible." Cameron said the Iranian government will face "serious consequences" for "its unacceptable failure" to protect diplomats in line with international law. He said those measures will be considered in the coming days, adding that Iran's government must immediately secure Britain's compound and ensure the safety of its embassy staff. Britain is also withdrawing some staff and dependents from the embassy after it was stormed by Iranian protesters, some of whom tossed petrol bombs at the facility, the Foreign Office said Wednesday. It declined to say how many people were being removed or give other details, but insisted that "ensuring the safety of our staff and their families is our immediate priority." Some diplomatic work is ongoing, though the embassy is officially closed. Hard-line protesters hauled down the Union Jack, set fire to an embassy vehicle and pelted buildings with petrol bombs on Tuesday in what apparently began as a state-approved show of anger over the latest Western sanctions to punish Iran for defiance over its nuclear program. Iran's parliament approved a bill Sunday to downgrade relations with Britain, one of America's closest allies with diplomatic envoys in the Islamic Republic. In the wake of the attack on the U.K. Embassy, a government official said Norway had also closed its embassy in Tehran due to security concerns. Foreign Ministry spokeswoman Hilde Steinfeld said the decision to close the embassy was taken late Tuesday, but that Norway's diplomatic staff have not been evacuated from the country. 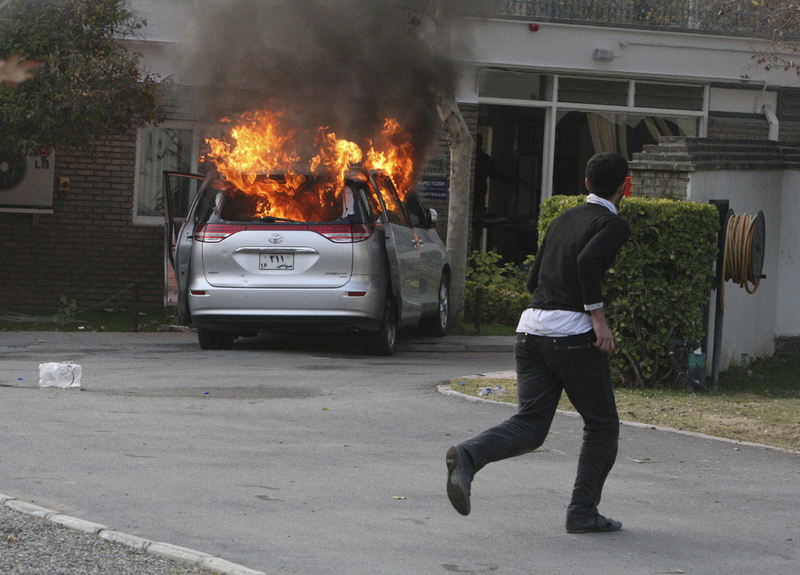 The hours-long assault Tuesday on the British Embassy and a residential complex for staff  in chaotic scenes reminiscent of the seizing of the U.S. Embassy in 1979  could push already frayed diplomatic ties toward the breaking point. The U.N. Security Council condemned the attacks "in the strongest terms" and on Wednesday U.S. Secretary of State Hillary Clinton described them as an "affront" to the international community. Even China, a major buyer of oil from Iran which has resisted proposed U.N. sanctions against Tehran's nuclear ambitions, offered criticism over the embassy raids. "China has always maintained that the safety and dignity of diplomatic personnel and properties must be ensured and protected," Chinese foreign ministry spokesman Hong Lei said Wednesday, according to Reuters news agency. "The attacks in question were contrary to international law and rules, and they should be appropriately dealt with."